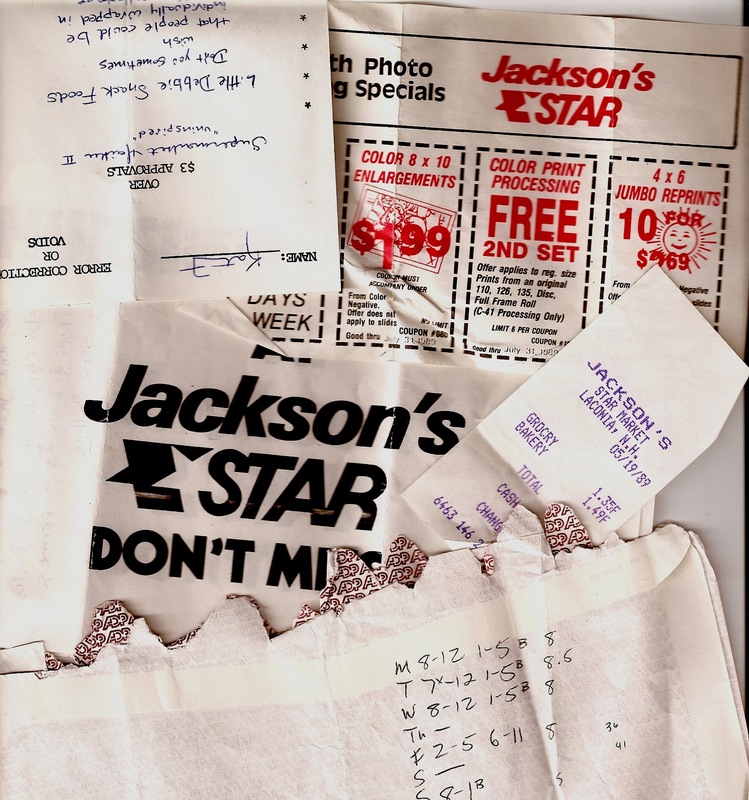 A few selections from the poetry I wrote in-between customers during the five years I worked at Jackson’s Star Market where I slowly made my way up the corporate ladder, from cash register to courtesy booth to bookkeeper. I’m sometimes a little amazed I ever made it out—and I admit I still occasionally get slightly traumatic flashbacks whenever I hear sappy Elton John or Gordon Lightfoot while being bathed in flickering fluorescent lighting. . . and I know I’m not the only soul who’s passed a year or two there (too many?). I’d love to hear what you did to keep your brains alive during your time served. . .and may I just add here that yes, this is not actual haiku–it’s just what I thought my poetry looked like when I wrote it on these narrow little register receipts. I am like feta cheese. . .
How did I pass the time? -ogling yourself, Cami, Kirsten, and the Moran sisters (remember them? Very tall “summer people” from Kansas, I think?). -hiding in the dairy cooler. -sitting on the benches out front eating quantities of food that now frighten me- two pieces of cheese cake and a quart of Hershey’s chocolate milk as a “snack” was not unheard of. Oh God I forgot about eating crap food at break. I probably would have eaten better if I’d worked at Dairy Queen. And of course I remember the Moran girls! I’m pretty sure one even married a Gilford boy, believe it or not. She probably met him at Jackson’s Star Market. . . If I remember correctly there were like 30 Moran siblings and 28 of them were girls. Also, what’s up Ken Barrett!? How many of us worked at Star? Did we overlap? Was I even ever there? I remember trying to learn to smoke and trying to quit at the same time. I’m glad I was successful at that. Love these Kate. I think Haiku is an unappreciated art form.